If your a bride with a Beach Wedding in mind than Caribbean music is probably at the top of your list. Or maybe your looking to spice up your next corporate event? RythmTrail can provide you with the best reggae, soca, calypso, or steel drum music in Kissimmee, or even the state of Florida. If you need to find Caribbean music for your next event RythmTrail can go national or internationally as well. With over 20 years of experience in steel drum music you can bet that you will get just what you want when you want it. If you have a listing of songs they can accommodate you. If you just aren’t sure at the time what Caribbean music you want to hear they can decide for you. Expressions on the dance floor whether your going for romantic, or house party, dance, or simply where ever your mood takes you they have the music for you. Make sure your next corporate event, Beach Wedding, or even house party goes off without a hitch and choose Caribbean music by a group you can trust. If you are in Kissimmee, Campbell, Hunter’s Creek, or even Meadow Woods RythmTrail steel drum band can entertain at your event. If you are simply looking for a single steel drum player for your next event RythmTrail steel drum band can accommodate as well. Make your next event one for the company album, family memories, or even party to remember with the best in Caribbean, Calypso, Soca, or steel drum music around. To get RythmTrail Steel Drum Band at your next event call them at (866) 495- 4522 or contact them online. Remember you can have your next Caribbean music experience with the click of your mouse don’t miss your chance to book them today! Today Oct 15 2016 our steel drum player will be playing at the Kissimmee Civic Center for the CAFA annual breakfast fundraiser. 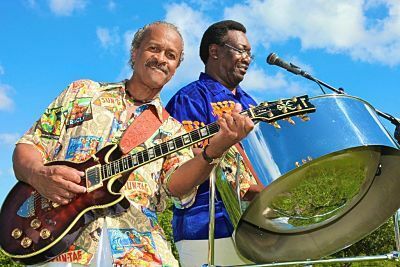 Book the best steel drum band in Kissimmee FL for your event.